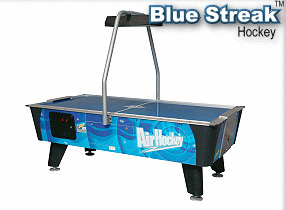 We offer a great selection of air hockey to choose from. To learn more visit the manufacturer websites below. 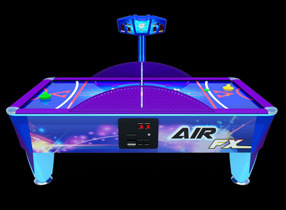 Whether you're looking for a new game to add to your home gameroom or a some new entertainment for your office, Air FX is perfect for any setting. 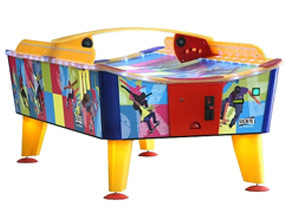 Ask about a custom wrap, marquee or logo to add to your air hockey table. The new Dynamo Blue Streak: combines eye-catching graphics and advanced technology that will take the coin-op industry by storm. Dynamo's exciting new Fire Storm hockey comes home. 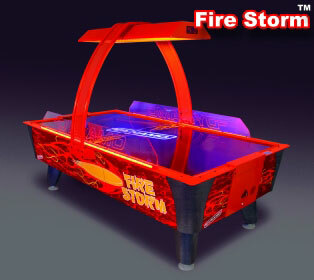 Packed with every thrilling feature found on our coin operated Fire Storm (except the coin mechanism) it is certain to liven up any game room; and because it is built with the same robust construction of our coin operated Fire Storm it will keep that room lively for many years to come. Invest in the best.